reviewstash / Despite any intentions, it's still griefing. » Despite any intentions, it's still griefing. My entire path and tunnel from my bridge to the center of spawn. Maybe it didn't fit someone's idea of what the "theme" should be (which is a B.S. idea anyways) but they could have discussed it with me. It was built before there ever was a "theme". My materials are now missing and the section closest to the bridge looks terrible (and unfinished) in my opinion. To whomever did it, if someone else built it, DON'T TOUCH IT! and dude, you are never around, how are we suposeded t know who build that? and as for materials, really dude? you care so much for some sandstone and bricks? 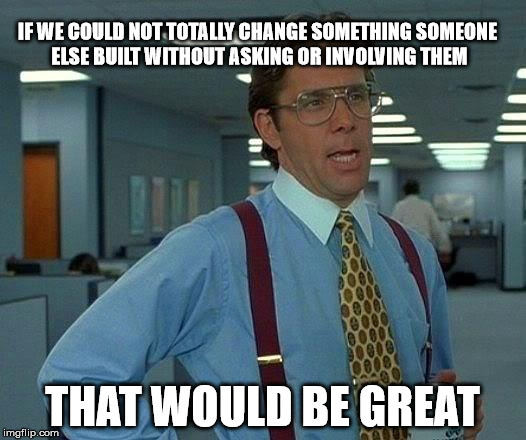 lets please just agree not to change others builds without permission.. even if they are ugly.. I would for example appreciate it if that horrendous wheatfarm streching into the middle of the ocean was removed. First off, ugly or not, if you didn't build it, don't touch it. Period. Second, I've been on almost every day except when I was on vacation, but again, doesn't matter who built it so long as it wasn't you. See my first point. Finally, yes, I do want my materials back. Call my petty, I don't care. Shouldn't have been removed in the first place. to everyone - for future reference, just because 1 person is "not active" when ur on doesn't mean they're actually inactive.